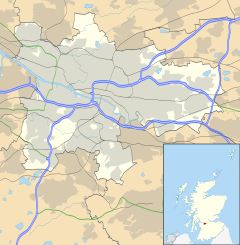 Newlands is a suburban area of the South Side of Glasgow, Scotland. The area is mainly residential in character. The Newlands fete is held annually and takes place within Newlands park. The largest retail facility in the district is the Morrisons supermarket (originally a Safeway) which also serves the adjacent districts of Shawlands and Pollokshaws. It is home to many traditional shops which include The Newlands Cafe. Newlands plays host to Junior side Pollok F.C. who play at Newlandsfield Park, regularly attracting crowds of over 500. It has an amateur football team, Newlands AFC who play in the Glasgow Colleges Second Division. Newlands has a Bowling Club, Tennis Club and a park which has tennis courts. Notable residents include Ricky Ross of Deacon Blue. The Glasgow district of Newlands originated as farmland around the manor house of Newlands. The estate was in Cathcart Parish on the opposite side of the White Cart Water from Pollokshaws which was in Eastwood Parish. The working farm buildings such as the stables, byre and dairy were situated at the "Mains of Newlands". ^ Scotland, Gerald Blaikie, Glasgow,. "Newlands, Glasgow : Illustrated Guide". Scotcities.com. Retrieved 2 September 2017.